Whorton Bend United Methodist Church is located about five miles south of Gadsden in Etowah County. It is surrounded by mountains on the north and west and on the south by the Coosa River. In its early history it was sparsely settled, but as the years passed it has become a very densely populated suburban community. Whorton Bend Methodist Church has a long and interesting history. The church was organized by the Rev. John Wesley Akin who was a long time and prominant minister in the North Alabama Conference. He was also the brother of Julia Akin Clonts whose family was among the Charter Members of the newly organized church. The church had its beginning on August 19, 1909 in a revival meeting held under a Brush Arbor on the present site. The revival was conducted by the Rev. J. Savage. The original roster consisted of thirty-four Charter Members derived from various denominations: Charlsie Adams, E.C. Adams, Jennie Adams, Charles Brown, D.A. Burns, Jeff Clonts, Jilia Clonts, Beatrice Clonts, William Clonts, Ernest Clonts, Alex W. Gann, Fannie Gann, Willie Mae Gann, Jessie Garmon, William Garmon, Lillie Garmon, Allie Kittle, Issac McCarver, Amanda McCarver, Jennie C. McCarver , Eve Belle McCarver, William Mooney, Mrs. William Mooney, John Mooney, Fannie H. Mooney, Cora Mooney, Thomas Potts, Buena Potts, Issac Whorton, Emma Whorton, Winnie Whorton, Ninnie Whorton, John Yaikow, and Mollie Yaikow. 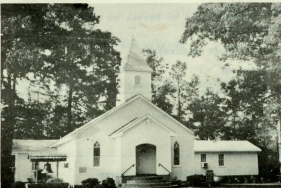 The plot of land on which a new Methodist Church was to be erected was donated by Tracy Lowery Whorton (son of WIlliam Madison Whorton and Texie Lowery Porter) his wife Anna Griffin and Charles R. Porter and his wife Lula Curry Porter. The original proposal was that the church be built on property donated by Elijah C. Adams which was adjacent to the Oako Glenn Garmon farm. 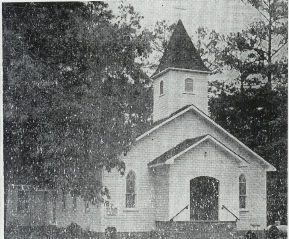 Until a new building could be erected, worship services were held in the inactive Cumberland Presbyterian Church, located 200 yards southeast of the present site. The original building was begun in 1911 and was built by members of the newly organized church and citizens of the community. It was not completely finished until some years later. The church was first known as Porter's Chapel. The first pastor to serve the church was the Rev. J. H. Cameron who served one year and was succeeded by the Rev. Mansfield, who also served one year. The original trustees of the new church were: W.R. Usry, R.A. Hollingsworth, High S. Ried, E.C. Adams, and J.W. Akridge. The membership grew under the four year tenure of Rev. W.M. Harris, young methodist minister, who was appointed through the East Gadsden Methodist Church. Rev. Harris was in turn followed by Revs. W.A. Hamrick, C.M. Small, Doyce Mitchell, Walker McBrayer, A.H. Williams, L.A. Sherrill, E.B. Branscomb, Lawrence Dill, Charles Adams, Guy Wallace, Henry Eddins, E.M. Williams, L.A. McConatha, A.T. Haywood, W. Davis, W.W. Woodburn, Curtis Day, L.A. Waits, Bennie Lows, W.R. Giddens, E.A. Wilks, L.V. Watson, Johnny Clotfelter, Jimmy Abernathy, Thomas I. Muskett, Richard Driskell (1970-1976, 1984-1985 - 2 terms), J.C. Hewett(1976-1984), Stan Hendricks(1985-1989), Bill Hitt(1989-1990), Suzanne Echols(1990-1992), Allen Payne(1992-1993, 2008-2009, 2010-2011), Wayne Nesbitt(1993-1996), Ray Lewis(1996-2002), Doyle Spinks(2002-2005), Sam Lasseter(2005), John Cosby (2005-2008), Diane Housler (2009-2010), George Creel (2010-2011), Bill Parker (2012-2013) and the present pastor, Joe Dismuke. Whorton Bend Methodist Church has been served by pastors who were appointed as ministers to a number of different circuits and charges in the Gadsden District by the North Alabama Conference. In past years the church has been on full time semi-retired pastors or those with other jobs. The membership of the church has remained stable throughout the years. The first addition to the original sanctuary was constructed in 1953, a west wing at the rear of the old auditorium. It provided rooms for sunday school classes. 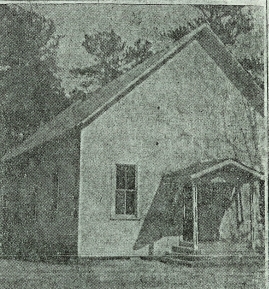 In 1955 the old original sanctuary was completely torn down, leaving the new annex. A new more modern church auditorium was built in its place. The pastor at this time was Rev. Alston Wilks from Pelcher, South Carolina and a student at Emory University. He was a vibrant an enthusiastic young minister, who made the following comment. 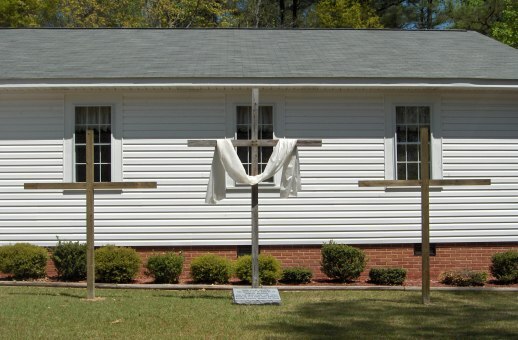 "This country church has been the very heart of Methodism." In 1970, the east wing annex was completed. The annex contains a fellowship hall, kitchen and bathrooms. All class rooms have been carpeted, some by individual donations, others by memorials by deceased loved ones. 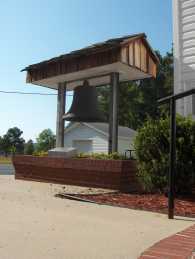 On July 4, 1976 a bell presented to Whorton Bend Methodist Church was erected on the west side of the main building. The bell was dedicated, the marker reads: "This bell hung in the Etowah County Courthouse from 1891-1950. Presented to Whorton Bend Methodist Church by Leila Mae Tarplay. In memory of Marvin Small - July 4th, 1976." *Information above was compiled by Mrs. Josephine Clonts. Assisted by Larry Garmon on April 1, 1985. In 1990, as planned, the fellowship hall was enlarged in order to accomodate more room for church related activities. In April of 2002, a flagpole was erected on the east side of the main building, it was later dedicated in May 2002 to former Pastor Ray Lewis and wife, Joye Lewis for 6 years as pastor of Whorton Bend United Methodist Church. The church acquired additional land (approx. 1 acre) behind the exisiting one acre already owned in 2003. *Information above was compiled by Joey Amberson. Assisted by Jean Garmon in March of 2005. In December 2006, a member of the church, Joey Amberson, donated a computer with a computerized bell system; the Church Council approved purchasing an amplifier and speakers. The bell system currently plays every day throughout the year every 15 minutes, with a hymn playing at the top of every hour from 8 AM to 8 PM. The whole mission of this project was to draw attention to the church from surrounding neighbors and to give a peaceful feeling when one hears the chimes. By the end of the 2006 Christmas season, several positive comments came from different members of the Whorton Bend Community! In 2012, church members got together and laid out plans, thoughts, and ideas about renovating the sanctuary that was built in the 1950�s. Together with prayers, monetary support, and input from many church members, plans were made to put in a new ceiling to brighten up the room, remove the carpet and exposing the already laid hardwood floors below. New pews, bulletin racks for the front entrance, a new cross hung on the wall behind the pulpit were purchased from Rainsville Pew Company in Rainsville, Alabama. New carpet was also laid outside at the front entrance to replace the old, weathered carpet. A new sound system was purchased, and a new sound booth was built in the rear of the sanctuary with help from several friends of the church. The last service held in the old sanctuary was on July 22, 2012 with work beginning soon after and taking about two months to complete. A dedication service was held on Sunday, September 30, 2012 with about 50 people in attendance, followed by a lunch in the fellowship hall. Many thanks to all who had a hand in helping with this project! *Information to the history of this church was compiled by past members and was updated in December of 2013 by Joey Amberson. This bell hung in the Etowah County Courthouse from 1891-1950. Presented to Whorton Bend Methodist Church by Leila Mae Tarplay. E.A. CLONTS, S.L. GANN, J.S. WILSON, COOLEY FULKS, MRS. J.T. PERRY"